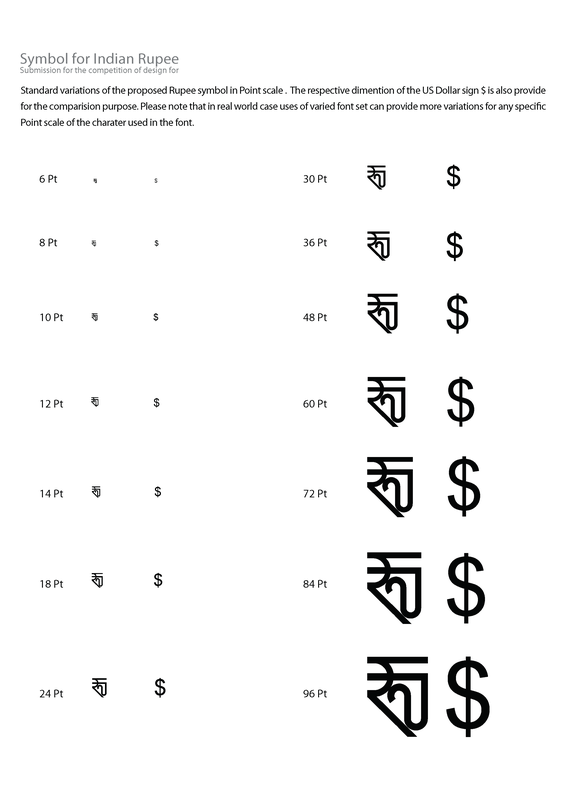 Here is some of the details from the entry I had submitted to Indian Rupee Symbol Design Contest. The Proposed symbol of “Rupee” is the synergy of several themes namely: antiquity and modernity; Indian-ness and the International culture; the East and West. The symbol has all the elements that projects its attributes that are strongly recognizably Indian about it and at the same time it has all the characteristics that makes it a part of the family of popular international currency symbols such the Pound (£), the US dollar ($), Yen (Y) and Euro (€). The focus of the design of this symbol was mainly along the following lines. Thematic aspect of the symbol : The symbol of Rupee must represent the unique characteristics of the essence of India — the symbol must be representative of what we can recognize as Indian character. Historically it must represent country’s rich past and it must present itself as the attestation of one of the culturally pregnant civilization. It must represent the India’s concept uniqueness in acting as a bridge for the East and West. Also it must signify the Indian spirit in “unity in diversity” — representing the fact that in today’s troubled times India can be an example in how people of different cast , race, color, language and religion live together in harmony and proper. Last but not the least, thematically the symbol must live upto the promise that Rupee is committing to the world at large that it has the stability which is required by any currency to be the player in the global stage. Simple graphics, strong and easy to write – a single symbol . Even weight – not overloaded with strokes or have any minor unnecessary lines . Width not exceeding that of a zero – so it can fit into columns for company reports and accounting . It should have a visual link with existing well-known currency symbols . It should be aesthetically pleasing and easy to write by hand. For this, the design is based on the concept of careful selection of glyphs/script elements from the two representative languages scripts – Devanāgarī and Latin Script/ English scripts. The symbol mainly takes glyphs from Devanāgarī to refer to the rich heritage and cultural ethos of India. The origin of the word “rupee” is found in the Sanskrit word rūp or rūpyāh, which means “wrought silver,” originally “something provided with an image, a coin,” from rupah “shape, likeness, image.” The Sanskrit word rūpyakam (Devanāgarī: रूप्यकम् ) means coin of silver. Also the case is true for the Hindi word rūpyāh (i.e. रुपया ), that was coined by Sher Shah Suri (1538-1545 AD) who introduced the silver Rupayya or Rupee coin. 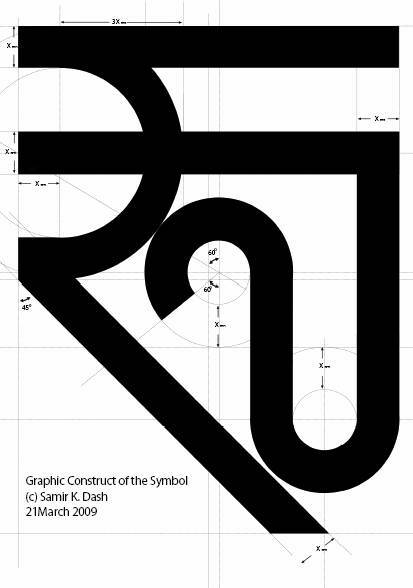 So from Hindi language : रुपया the proposed symbol takes the first character. Considering this the symbol takes its character from the First two characters (i.e. “Ru”)of the English name “Rupee”. Of course , the representation of the different characters from the two polar opposite script system (English standing for Western Philosohy and Devanagari as a part of Eastern philosophy) were represented in such a way that it results in an unique design concept that do justice to both of the script systems. The ”Ru” comes from the the Latin script/English script that is most representative of the West , its culture and historical ethos and by making it the part of the symbol makes it truly the point of synergy that represents the world harmony and peaceful coexistence of different cultural and regional elements. This also is the representative of India’s nature of tolerance and respect for different languages and culture, on the basis of which different people of varied cultural, language and racial domains live together and prosper in India even in today’s troubled times. Attempts were also made that the glyph elements are merged in such a way to create the new aesthetic graphical representation that will contain in it-self the memory of the traditional use of abbreviations of the word “Rupee” and ”Rupees” as “Rp” and “Rs” respectively. If the proposed symbol is closely observed , next to R the “s” seems to be there in Flipped vertically. Similarly the presence of “p” next to “R” can be felt where “p” seems to be flipped with 90 degree clockwise. Representing these two aspects with out any prominence in the symbol shows how these two past elements of “Rupee” character are deprecated. The expectation from the proposed symbol references the fact that this could be a powerful part of the country’s brand iconography, a signal of stability. And the concept of “stability” can be easily convinced by the international mass through the use of “horizontal lines” found in almost all the currency symbols. The lines provide the symbol the required visual link with existing well-known currency symbols – and that makes it visually one of the same family of symbols that of others and preserving its uniqueness at the same time. The symbol uses even lines of same thickness for its representation. As the soul focus behind symbol is to make it from a “simple graphical elements that will make it easy to write and easy to remember”. Apart from this the symbol is designed with the spirit to look unique as well as with the familiarity elements in the family of other major currency symbols. Last but not the least the concept is to have a clean and even weight – not overloaded with strokes or have any minor unnecessary lines. The symbol design must be applicable to the standard key board – keeping in mind that the design will be used by various Font makers to create varied form of the symbol to include it in their Font sets. Every effort has been made to make the proposed symbol representative of the India in all its aspects and easily comprehensible to the eyes of international mass. Great effort , very comprehensive presentation. But i feel this is too complex for the rupee symbol. Dont you think that it is very difficult to actually write it in ause it in everyday life. the dollar has S and 2 verticals, Euro has C and 2 horizantals,, thats simple..but this has too many elements to remember and scribble. Also please let me know how this is applicable to a standard keyboard. Thanks for your feedbacks on the design. Comparing it with any Indic scripts you can notice its similarity of writing it in hand using only two strokes…one with the major glyph (similar to hindi Ru ) and the second to write the matra type minor glyph….However you can not expect to just use a straight line or just one curve to represent ultural ethos… balance has to be there…I had given thoughts to more than 170 designs and then came to conclusion to submit this one, just because it is balanced in all aspect. More over have you tried any designs that commonly come to mind …say the ones you can see in http://economictimes.indiatimes.com/rupeesurvey.cms …Do you really think the said symbol is any complex to memorise or write than these? Regarding the symbol’s usability for a standard key board I had created a font using this symbol to check if it fits in the typeface development point of view and had submitted a type set example comparing it with 6Pt onwards to something like 75 or 90 Pt. In this blog post I have only presented some details from the synopsis of the technical and thematical details I have submitted to the contest. I will release the full document with all the technical and design specs soon. May be that will help to explain it better. Anyway I gave it a try..let’s see what they are selecting. Very Good. Well done. You seem to have put in great efforts for a great cause. May i know your background , vis a vis design and the like ! Nice work. The detailing in the presentation is commendable. The idealogy & facts are fine, but I have to agree with Manthra on the fact that the symbol is a bit complex to be written by hand. You have designed it & probably don’t realise the complexity (which a user/viewer whose not from a graphic design background) may have to face. The economic times designs shoulnd’t have been your benchmark. 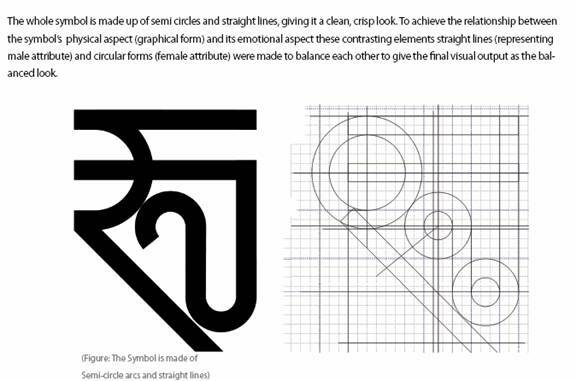 Also, the english & devnagiri scripts unite to form the current symbol but if I hadn’t gone through the presentation I wouldn’t have been able to figure it out beacause it looks like a fancy “रू” at first look. I’ve seen the symbol variations page and the symbol seems to lose its shape when scaled down. But it’s a commendable effort on your part specially if you have given thoughts to 170 designs. The complexity of writing the symbol by hand is as complex (or as simple ) as writing the hindi any of these following characters like ख झ औ स ख़ ॠ श ह ई .So if we can remember thse I don’t think there should be any issues with the symbol I have proposed. But at the same time I do agree that these are not as simple as english charcters like i j s y j t p o and the like…but also not to forget that the symbol has to take its reference from any Indic characters as required by finance ministry…so i could not come up with a better one which can truthfully represent itself as a cultural icon as well as have the balanced look and theme for international mass. Also please don’t go by the technical specs of the graphical representation, when a common man writes he need not to be worried about these…the specs are for the font makers if they want to use it then that will come handy to create a standard font out of it and also to apply it to the unicode chart if needed. Also they define the dimensions of the symbol in a manner that will help them to recreate it using same propertions and even strokes. Thanks a lot for the support . I appreciate the design for its simplicity. I feel the symbol can be easily remembered and written…Its just like we write in hindi…and hindi characters are complex to write too if we call this symbol complex. Also I liked it because its unique as it represents so many things which itself is a great challenge in any sytmbol design. Good design man. its unique and original.good thingie is u have given thoughts to all the aspects.the symbold seems simple enough to write and remember.keep it up. And your presentation is alsmost same as that of mine…..
It’s great to see someone has taken so much time & effort to design the symbol. However, I agree with some of the posts above – it is a little too complex & overdone. Maybe Indians used to the Devanagari might somehow manage to write it (not without effort), but what about internationally? And what about Indians not writing in Devanagari? Also, it will be a killer for font designers to design the symbol for each individual font. If you look across existing currency symbols, the ones that really stay in your mind are the ones that are the simplest, and require 2-3 strokes to write at most. Also, complex symbols tend to coalesce when scaled to small sizes. Anyway, whatever said and done, I really do hope the finance ministry is serious about this competition, and is just not after collecting money from the contributors. The funny part is, they haven’t even mentioned the dates when the results will be announced! P.S. : Now that the competition is over, maybe someone should make a website where people who have submitted their designs can upload them for others to see & comment. There are many aspect of the symbol that needs to balance…while some believe (see BBC news article) that the representation of cultural ethos is not possible in a currency symbol, our govt does not wants the currency symbol to be with out it. To quote — “The idea that the symbol should have some cultural significance is a difficult one,” she says. “The dollar, for example, doesn’t signify liberty and freedom – there is nothing recognisably American about it.” — Now does that hint something? The second thing is that its not that only devnagari is there in the presented symbol…you can see the Latin combination standing for “Ru”…, but being indians we only highlight the Devanagari first as it is what comes to our mind first… for foreign eyes the Latin script part glyph is what makes more sense and they see it that way only. 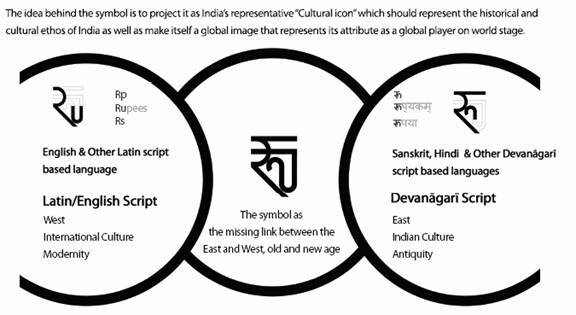 The second point is that thematically representing India is a complex topic in itself, now if we choose some other regional script that won’t dop justice (see the symbol explaination in the post)…and I don’t think being secular we should risk to represent that. Other way round …do you think you need more than 2-3 strokes to write it? It contains same stroke frequencies as Hindi Ru and English Ru…no diff at all …however we can not expect to design a symbol that is already there? Anyway the problem is about how can we appeal different aspects and different masses of different tastes?Its Aesop’s fable of a father, son and a horse. Creating the currency symbol for India is a big challenge in itself, specially from this angle. I do agree that there should be a site where all the symbol entries can be uploaded …at least peple can see different ideas for the currency symbol. By the way, those symbols up for voting on the Economic Times website are terrible! Good discussion here. The symbol is interesting enough for the European eyes. Good implementation of iconography techniques.The symbol represents the indian currency truthfully.Nice work dude. I feel the symbol you have presented can give a good facelift to currently used symbol “Rs”.Personally I want the old “Rs” to remain there, but looking into your symbol I see the my favourite symbol there. Cool icon you have made. Best of Luck! Just for everyone’s information, I spoke to Mr. Saini in the currency department of the finance ministry today, to know when the results would be announced since they haven’t mentioned anything about it. He said he had no idea, but said it might take quite a while because they have received a lot of entries from all over the country. However he said that once they make a decision, it will be made public, either through an advertisement or a notice on their website. [PHONE NUMBER REMOVED ON REQUEST TO AVOID SPAM CALLS] : Mr B.S. Rawat, the main guy behind the competition notice (out of the country till Sunday). [PHONE NUMBER REMOVED ON REQUEST TO AVOID SPAM CALLS]: Mr B.S. Saini, the person I spoke to in the currency department. I request people to check up on them once in a while (please don’t flood their office with phone calls every single day! ), just to remind them that everyone is serious & eager about the dates of the outcome. for selection of design for the Indian Rupee. Would it be nice if you could request them to put all the SHORTLISTED’ designs in a web site, so that the citizens could also become part of the selection process. Needless to say that the anonymity of the designers should be maintained until final selection. The interaction may be planned in a similar manner as done by the Sixth Central Pay Commission through their website. 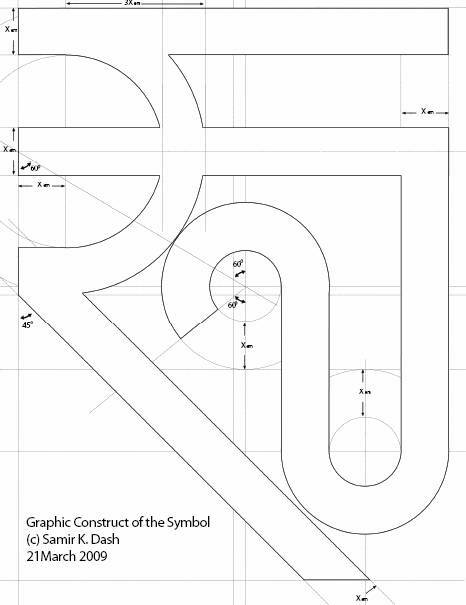 The symbol is as simple as writing the hindi character “रू” by hand (which has been used by people for a long time to represent rupee word in Hindi). You can write he symbol using just two strokes. No complexity at all for anyone to write it by hand. Even those who are comfortable in writing “Ru” can find the symbol simple enough to write by hand. Hi Samir, Good to know that someone has put in so much effort in designing the symbol. I think symbol is easy enough for hand write. But have you tested the symbol in lowscreen devices ? Good to add the animated gif showing how to write the symbol by hand. The symbol is simple like any other characters in English too. Let me assure you that the resulatant visual representation of the symbol in lower Pt sizes is equivalent to that of the common $ sign. I had spent few hours in creating a real TTF font out of the symbol to test it on small pointy sizes specially in small screen mobile handsets with low resolutions to compare its legibility with that of other popular currency symbols. That is also the reason, any uneven stroke has been avaoided in designing the symbol and every care has been taken to define the base angles at which the strokes should be present in it so that the final out put of the symbol does not detoriate at lower Pt sizes. In case you are copmparing the pt sizes image provided, please note that the representation sheet is the out put of Bitmapped font. (Also note that only if to avoid the strokes makes a symbol good at lower point sizes then on your medicine strips you would have found only a simple straight lines or just “0” s). I The case is equally true to the symbol as it is with any Russian alphabet. Defining the base dimension of any symbol and making a font variations for better representation in different resolutions and pt sizes are two different things. And I hope as a typographic designer you understand it well. I assure that all typographical conventions have been taken care while designing the symbol. As far as the case of writing quickly the character I do feel the person who is intending to write this symbol has to write something other than thiss too ….say he needs to add some price numbers too …so what about that? Also it takes averagely 1.5 seconds to recreate the symbol by hand using just 2 strokes . Hope that is good enough for any character. I am sure nobody will try to compromise with the meaning of a character by expecting the charaters to turn into “0”s (zeros) just because it can be written faster? People are not expected to understand binaries by using a set of symbols. Personally I don’t think whether any symbol designed by one is better than designed by another…rather it is the context on which it is presented that matters. It is the spirit behind all the designs that different people have ceated that matters the most. as per less amount of information given of government site, u did wonderful…! I have rooting for your design..on my blog. Thanks Gitesh. Let the best design win. Its indeed a great design, and concept. But I would definitely agree with the rest that your design would be a complex one and it wont be that feasible for people to draw it at hand. The symbol you have opted for (from Economic Times design ) http://economictimes.indiatimes.com/photo/4344069.cms looks good, except for the fact that it has both minor and major strokes. However this can be eradicated using a standard type font design…I am not sure how it represents the India’s cultural ethos. Anyway let’s wait and see what government decides on. I liked the design Samir. I don’t agree to those who say it is coplex to write by hand. Rather it is good combination of iconography techniques and aesthetic elements. Good job. Good design. Cheers to you. I really appreciate you for the great effort spent in designing the symbol and then presenting the same. It’s simply amazing. The first thought that came to my mind after seeing the symbol was,”it looks like the hindi alphabet corresponding to ‘Ru’ “. I couldn’t figure out the hidden Ru and Rs. It is interesting to see this hidden message. However one point of concern is, it seems slightly difficult to write. I am a non-hindi person and i found it difficult to write, when i tried it. Apart from this usability, this is a great concept. Simple, aesthetic,charming.this all i can say about your symbol.this is the best that can represent rupee.the explaination is also justified. I really like your design. Good to read the explanation of the symbol . I am planning for startup company.so would you like to be interested in designing our logo? I have read somewhere you have been involved with rebranding activities of some european domains of Xerox.